The QSTP AutoUpdate sample will show you how we could have added AutoUpdate capability to QSetup (This is just a sample - that is not distributed to users). The first step takes place when we create the first (original) setup. At this stage only the first 2 areas ("General" and "Original Setup") of the "AutoUpdate" page are important so we have painted the third area in black. We define Name of UPDATE Project to be qstpupdate. Later on (in the next steps) 2 files will be created with the names: "qstpupdate.info" & "qstpupdate.update". 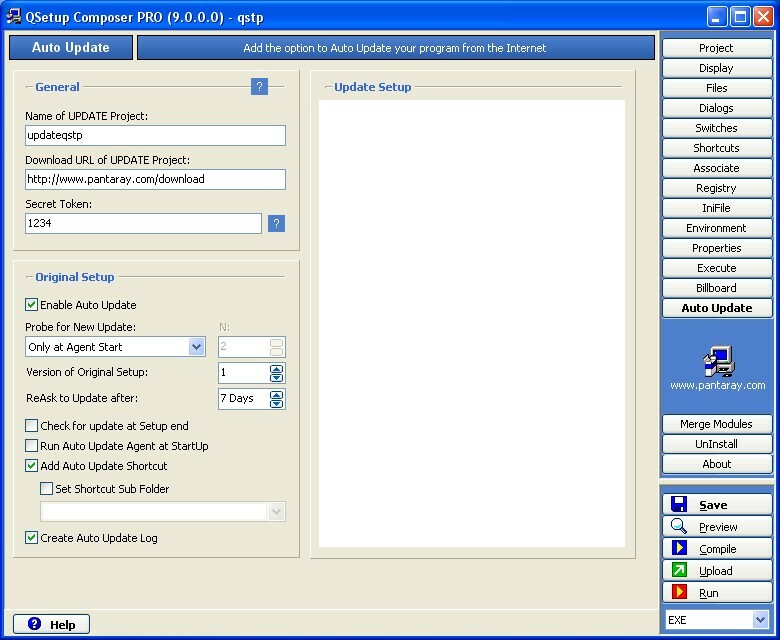 We define Download URL of UPDATE Project to be "http://www.pantaray.com/download". In the next steps the files "qstpupdate.info" & "qstpupdate.update" will be posted in this location. We define the Secret Token to be 1234. We want the agent to test for new update every 2 hours. The version of the current release is 1. If the user declines when prompted to AutoUpdate we want to prompt him once again after 1 week (7 days). We want the Agent to start automatically at computer startup. We want to provide the user the option to manually check if an Update is available. We now proceed to compile the AutoUpdate files. For this operation we will need the third area ("Update Setup") of the AutoUpdate page. We select qstpupdate.update as our update file. We specify that IF QSetup.exe (the composer) is running it should be closed before AutoUpdate starts. We specify that the agent should send a WM_QUIT message to the composer as a shut down signal. We specify that the version of this Update is 2. We specify that this update should take place only if the current version on the target machine is 1. We specify to Request Confirmation before Download. We specify to Request Confirmation befor Install. We specify to Inform User when update is finished. We specify to Restart Process when Update is Finished - that means that if the agent has closed QSetup.exe it will now restart it. Remember the Test Mode is still checked. So we can test our update before we upload it to the web. We go to "Start/Program/Qsetup Installation Suite" and click Check for New Update. We click YES and the agent will install the updated version of QSetup on our machine. Now it's time to upload our update files to our website. And use the FTP service of QSetup to upload the files "qstpupdate.info" & "qstpupdate.update" to our WebSite in the directory: download. Now the creation of the AutoUpdate option is concluded. We may repeat Step-2 for any future update. If we only provide updates and not intend to provide a new setup file then there is NO need to increment the Version of Original Setup on the second area.